a. Load letter-size plain paper. b. Press the * and # keys simultaneously. c. Enter 123 (or 124) on printer’s keypad. The ‘Support xxxxxx’ menu should be displayed. d. Use the arrow keys to navigate to the Reports Menu. Select Ok.
e. Use the arrow keys to navigate to the ‘print-mech button tap’ menu. f. Select Ok. Screen should display “code = 0”. g. Use the arrow keys to enter “code = 43” (or just enter 43 on keypad). Select Ok. The Tap 41 diagnostic test report prints. 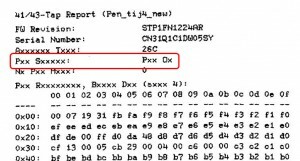 Check the 4th line at the top of the printed report; an electrically good/stable PRINTHEAD will state “Pen Status: Pen OK” (printed as “Pxx Sxxxxx: Pxx Ox”)………if any other message is displayed, such as “missing” or “failed” (printed as “Pxx Mxxxxxx” or “Pxx Fxxxxx”), then the PRINTHEAD may have failed and may need to be replaced. NOTE: On newer Officejet printer models you may need to input ‘code = 41’. To rule out Printhead connectivity problems, remove the ink cartridges and PRINTHEAD. Thoroughly clean PRINTHEAD and CARRIAGE electrical contacts, reinstall and repeat ‘Tap 43’ test to see if print quality improves.